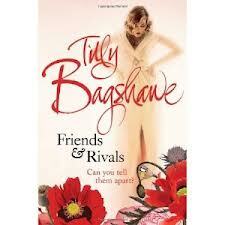 Friends and Rivals is my first book by Tilly Bagshawe and I fell in love with the cover of this hardback book although very simplistic it is beautiful I was just hoping I would love the story inside just as much. Kat fears she is past her prime. Her philandering husband, Ivan, who she still loves passionately after twenty years of marriage, leaves her for a younger woman. Devastated, there is only one person left who Kat trusts. Friends and Rivals was not what I was expecting at all but it was a great surprise I really enjoyed this book. What I loved the most is how different each of the characters were and how well they were developed considering how big a part each character played in the book. Usually when there is a big cast of characters in a book there always seems to be one or two characters who outshines everyone else but this isn’t the case in this book I really felt as though I got to know each and every character in this book. There is a different character for everyone but combined together they complement the book by bringing you a little of each personality to this action packed, tense storyline. The storyline is very much based around fame and fortune and the music industry but with the added bonus of many relationships and friendships with spanners in the works. All the way through this book I was never quite sure what was going to happen on the next chapter and there was no way of predicting who would end up with who as there is so much betrayal and rivalry between numerous amount of characters. My favourite two characters had to be Jack and Catriona they had a more gentler and down to earth feel to them and I was hoping all the way through that they would finally get together to nurse each other’s broken hearts but in fiction books you never know how the relationships will end up! The author is a little gem and gives us a perfect ending to the book by tying up all the loose ends to the storyline rather than leaving us on a cliff hanger but you just have to read this book to see if the outcomes are what you were expecting! Looking for an intense read full of rivalry and betrayal, glamour and romance then look no further!